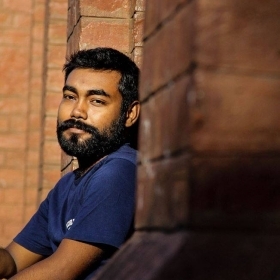 Md Enamul Kabir is a Dhaka based freelance photographer. He is also part of collective called The Orange Moon and OnEdge Street. His work has been published in several national and international magazines, newspapers including ISP Magazine, FLIP Magazine London. For him, photography is all about moment and story which becomes the witness. He loves his photos to be concise and cohesive and he tries to achieve the best result possible with fewer subjects. Apart that Enamul loves to take photos of animals. Photography helps him to overcome his loneliness and frustrations. His work is exhibited in HIPA-2014, Miami Street Photography Festival-2016, StreetFoto San Francisco-2016,2017, LSPF-2017, Summer in Your City-2017 and also published interview in many magazine and blogs including 121clicks and in-public.